Life | The Messy Palette . . . I came up with another excuse for putting off blogging: my mouse died. After countless years with my pet mouse, he (it) bit the dust. I simply cannot get the hang of keyboarding with my pinkie. But now I have a brand new purple mouse from Office Max, and I’m eager to blog. I LOVE the color purple! Obviously, the long skinny panel above wouldn’t fit into my phone camera without showing the surround of our front door and a rug. But you get the idea that by February in Wisconsin those of us who do not care to ski, skate, or roll in snow are dreaming—even pining—for spring. Nowhere does this longing express itself more blatantly than in our home. Flowers are blooming all over the place! This gallery wrap canvas experienced many mutations. The pink at the top began as foxgloves, those deadly but lovely bell-shaped flowers that always remind me of Beatrix Potter’s foolish duck who laid her eggs under the “protection” of the Foxy Gentleman who lounged among the foxgloves. My foxgloves were rather ugly, so I tried to morph them into tulips. The tulips were equally unpleasant, so I dabbed away—adding gouache—until the tulips became those fragrant blossoms that most anyone can render convincingly: lilacs. Yes, May!!! Next down the line were purple irides (otherwise known as irises), something I can normally manage to paint because of their ruffles. Then more lilacs or maybe pink irides, and finally my beloved mertensia—Virginia bluebells. A lot of gouache was layered onto this watercolor flower arrangement, giving the panel a nice textured effect. I painted the sides with acrylic, because when I spray the finished panel with an acrylic fixative for preservation it is easy to cover the flat surface—but the sides are harder to spray. I want to make sure my gallery wrap panels will last, at least for a few decades and perhaps longer. My only reason for not sitting down to my computer would be a feeble excuse: I don’t like to have to stay indoors in the summer. Well that doesn’t fly: 1) I could take my laptop outdoors; 2) I could blog on my I-pad; 3) Even in the summer there is some indoor weather in Wisconsin; and 4) Summer of 2017 is long gone. And here is some art, “Autumn Garden at Night”. ⇑ The piece is gouache on a gallerywrap canvas, and it comes with poignant memories. Beginning last March, our precious Pembroke Welsh Corgi, Dylan, started to decline. He need to be taken out many times in a 24 hour period, so—like Robert Frost—I became very “acquainted with the night”. March, April, and May nights were blustery, damp, and cold—but summer and early autumn were lovely. Dylan and I, attached at the hip since Joe and I brought him home from a farm in Iowa in early 2004, had countless precious nocturnal jaunts in our quiet courtyard lit by the patio light and the rosy solar lights in my gardens. Hence the above rendering. Our Denver son, Karl, would like this painting and it will be his as soon as I find a way to get it to him, hopefully barring UPS or Priority Mail. But I am happy to have the picture in my computer, and on prints which I can share. Dylan died peacefully in my arms on October 16th. I think he had that famous corgi smile on his face right up to his last sigh. Meanwhile, I worship a Living Savior and praise Him for LIFE—for people to love and “all creatures great and small”. May God bless you and your families with a beautiful holiday season—wherever, and whomever you are. Another DVD I watch and absorb again and again is Taylor Ikin’s DANCING WITH YUPO. This Florida-based fine artist’s (1 hour, 58 minute) tutorial has probably done as much, if not more, to free me up and send me painting on my way—as any other resource in my sizeable home library of books and DVDs. The huge secret (but not REALLY a secret!) 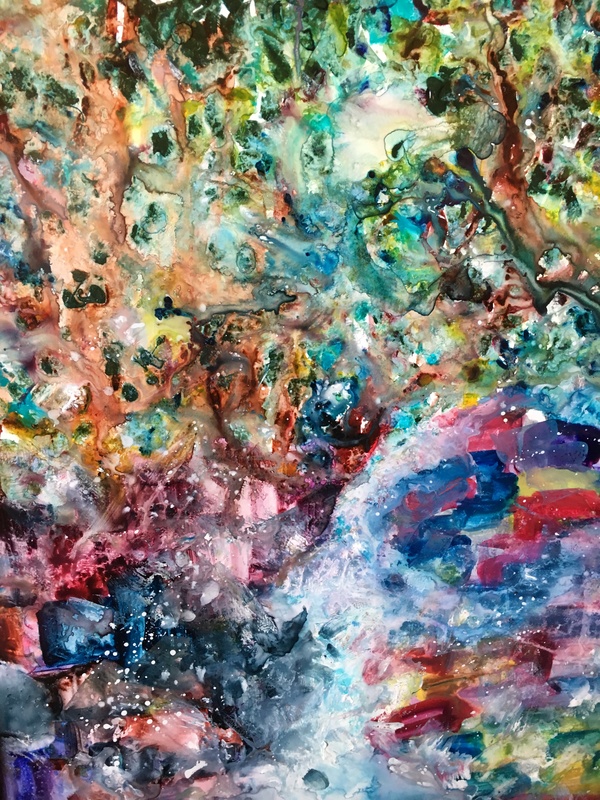 is Taylor Ikin’s use of YUPO® paper, which is actually not paper but rather a shiny washable plastic–coupled with her method of always standing and moving around* while working, and using totally-generous, extra-humungous amounts of paint mainly applied with a 2″ or larger square brush. In her DVD Taylor Ikin depicts a downhill stream tumbling over rocks, with a forest in the background and lots of wild growth along the banks. Taylor begins by spritzing the sheet of YUPO with her spray bottle of water, and applying thick brush loads of rich undiluted colors for woods, water, foliage, rocks, and botanical stuff along the forest floor and riverbanks. I have read books and watched tutorials by other YUPO artists, and quite frankly I have not warmed up to their work. Excellently crafted, but simply not what I would want to hang on my walls. But Taylor Ikin’s work has that magical quality to which I am inexorably drawn. Try GOOGLING her, and maybe you will be drawn as well. YUPO is the perfect ground for the abstract realism style that I love. It is perhaps the easiest surface for beginning painters to use because (unless you desire to create detailed, representational art that resembles a photograph) YUPO is encouragingly NO-FAIL Every blob and drip of paint that blends with other drips and blobs will be beautiful. A few quick blasts of diverse colors on wet YUPO are often “suitable for framing”. But when more painstaking hours are invested, the rewards are even more incredibly satisfying. One can play forever, with just one sheet of YUPO, painting and rinsing off the paint, experimenting with colors and brushstrokes. Or finger strokes. I have rediscovered the joy of finger painting, due to the fact that I have long hair and lots of it. Frequently I spy a wisp of my hair in a work in progress. I dislike hair in a painting almost as much as I hate to find it in my food! In the process of removing a hair with my pinky, gorgeous swirls will surface on YUPO. Texture is easily achieved on YUPO—either by the application of modeling paste to make mountains, rocks, and tree trunks, or by dribbling texture medium onto the painted surface. Salt and cling film (plastic food wrap) build texture as well. 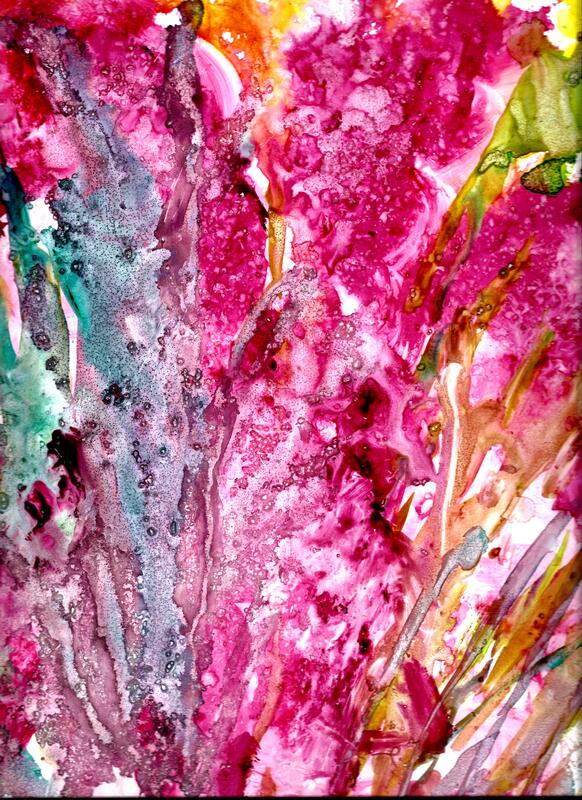 The acrylic inks are vibrant on YUPO paper. Another favorite technique is the slathering of gouache over water-colored areas. The gouache may be built up impasto, to fashion floral still lifes or wild landscapes, while looking amazingly like oil paint. I always spray my finished YUPO paintings with an acrylic fixative; this not only prevents smudging and smearing paint forever, but the fixative makes a lovely shine (although matt fixatives may be used if so desired). Also, the acrylic spray will prevent the impasto gouache areas from flaking. Thank you, Taylor Ikin, for your continual inspiration from DANCING WITH YUPO! I have always loved to dance! 🙂 Here is a fresh off-the-messy-palette YUPO piece by moi. It is titled “Irides”. I can’t stop painting irides. Although I’m certainly not to be compared with Monet (YIKES!) that master and I do have something in common: repetition of a beloved subject. Monet did haystacks and water lilies among other topics. I do irides, along with woods, mountains, etc. What a good life! **I am not a fan of drying paintings with a hair dryer, and rarely do this. But once I tried it on a YUPO piece. Not good! Too much heat, too close to the painting ground and voilà—shriveled-up art. I recall several occasions where I realized I was getting sick and could feel a fever rising in my body. Thinking the outdoor cold would squelch the flu bug (or whatever), I’d avoid mentioning how I felt to my very solicitous mother, and stay outside as long as I could stand my hot cheeks and shivering self before going indoors and allowing myself to be put to bed with hot lemonade and honey. What in the world does all this nostalgia have to do with THE MESSY PALETTE? Simply this: Now I am 83 years old and I no longer LOVE winter! I have become a WUSS! Granted, snow is beautiful. In fact, I actually go out and tramp around in the first couple of snowfalls. But in recent years winter has gotten old very fast. By March, when I’ve wanted to peel off layers of clothing and renew my store of solar energy, I have found the snowy cold weather to be absolutely annoying. Determined to put a positive spin on the days ahead, I have created a Three Pronged Plan: 1) putting on another sweater when the indoor temperature drops to 70 or 68 degrees, rather than bumping the thermostat to 75; 2) staying outdoors longer each time I need to take my beloved corgi out to do his jobs; and 3) the aforementioned—celebrating winter with my paints. *Yes, I know. The expression “old geezers” is certainly not politically correct. Yikes! Who cares? Anyway, I can use the label because I am one! And proud of it!